Sixteen-year-old Elise Dembowski says she was born to be unpopular. She’s precocious and works hard. She’s not extremely beautiful, and she missed out on that day where they tell everyone how to make friends and be cool. Of course, there is no such day—we’ve all felt that way from time to time, like we missed out on the What You’re Supposed to Do Day at school. The cool kids at Glendale High picked on her for being nerdy. She had no friends. Literally. No friends. She found herself hoping a friendship would develop when a smart-yet-nice girl, Emelia Kindl, asked to borrow a pen the first day of sophomore year. Then Emelia did the unforgivable. Emelia called 911 that night, after Elise called her to say that she’d cut her wrists. Elise missed a few weeks of school, then returned to the same old drudgery. School sucked, and she was shuffled between her divorced parents to the point where everyone had to synch smartphones and have an Elise Calendar so they’d know where she was supposed to be. Elise took to sneaking out after bedtime and taking long walks, just her and her iPod. One night, her aimless wandering carried her to a warehouse district. There were two cool, pretty girls across the street. They called out to her. Elise had no idea what they wanted, but she crossed the quiet street. The girls were named Vicky and Pippa, and now Elise had friends. Inside that warehouse was Start, the hottest dance party in Glendale: hundreds of people, dancing, drinking, and having fun amidst blaring music and hypnotic lights. Elise didn’t stay long, but she was hooked. Here was a world where she could be herself and have friends. Emilia returned to Start every Thursday. She became friends with Mel the bouncer—three friends now!—and she met the DJ, Char. Char was an okay looking guy, but he was the DJ; he had the power over all those people on the floor. Elise was intrigued. Elise set up a DJ rig in her bedroom, and taught herself how to mix records. She got pretty good after a couple weeks. Char gave her a half-hour guest slot one night, and she did okay. He offered to teach her how to get to the next level. Then she got really good. And she and Char did a little mixing of the physical kind as well. Elise was a Start regular, with friends and a regular half-hour DJ slot during Char’s show, but she was still a nobody at school. What she needed was a way to mix the two, because isn’t that what DJ’s do? They mix. DJ-ing is a perfect metaphor for Elise’s life. She obviously wasn’t inherently uncool, or the people at Start never would have liked her. She wasn’t unlovable—her parents, stepfather, and her two half-siblings all adored her. She didn’t even lack self-confidence. 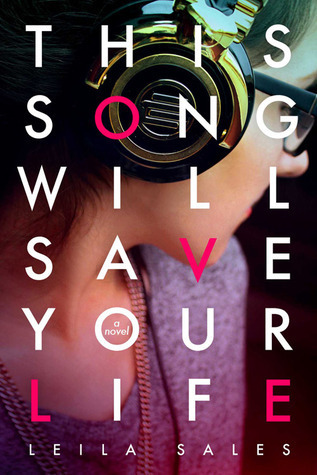 Author Leila Sales has created a gem in “This Song Will Save Your Life.” High school can be a living hell—we all know that. Ms. Sales shows us how these pressures and jabs leave Elise flailing powerlessly. And yet a different Elise emerges at Start. In the club world, she’s adored and recognized, praised and photographed. We can’t help but pull for Elise, and Leila Sales ties everything up in a satisfying, not-overly-hokey way. Elise is not perfect. She makes mistakes and hurts some people along the way, as we humans do. Elise learns to make amends and forgive herself. Self-forgiveness: it’s one of the hardest things they must have taught on that What You’re Supposed to Do Day we all missed. Ultimately, Elise accepts this lesson, embraces her uniqueness, and finally achieves that elusive perfect mix. This entry was posted in Books, General Fiction, Young Adult. Bookmark the permalink.